After the success of "The Alternate Moody Blue" Hepcat records releases "The Alternate Today". 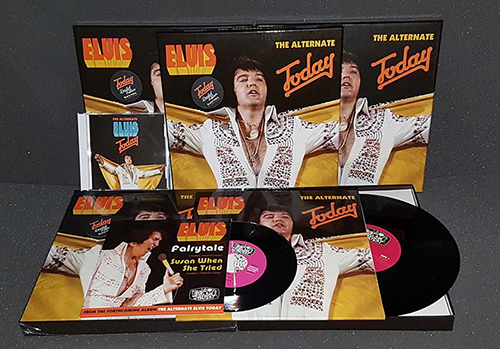 Elvis' last real studio sessions took place on March 10-13, 1975 and resulted in the Today album. Nearby 43 years later Hepcat records releases "The Alternate Today". This deluxe 10 inch boxset contains a 10 inch vinyl record, a 45 RPM single and a fully packed CD. The 45 RPM features the unique combination "Fairytale" & "Susan when she tried". A companion double vinyl album will be released in 2018 for the album lovers. Available on black and blue vinyl.